ETLG Inertial Aerosystems announce models 2240 (single axis) and 2480 (3-axis) MEMS Variable Capacitive Accelerometers. The units are low-cost, integrated plug-and-play measurement devices in rugged, hermetically sealed titanium cases. They are suitable for zero-to-medium frequency commercial and industrial applications, and particularly where reliable performance, extremely low noise, and long-term stability are absolute requirements. The cases are rated IP 67; the connector is rated IP 61 and can meet IP 67 when sealed with a boot, sleeve, or heat shrink. 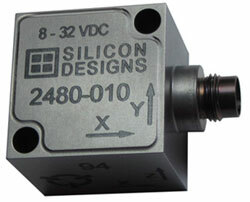 Each SDI 2240 and 2480 accelerometer features onboard voltage regulation and an internal voltage reference to eliminate the need for precision power supplies. They are relatively insensitive to temperature changes and gradients from -55 to +125C. The case is easily mounted via two screws, adhesive, or by attaching a magnet..